HyPERFORMANCE Cara Jodhpurs put a bit of fun in your riding with these great knee pad pattern designs. Classic child's jodhpur: comfortable, practical and stylish. 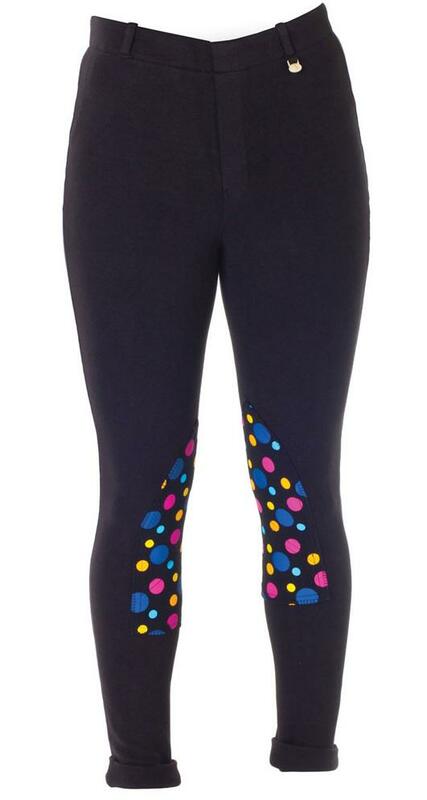 Premium weight 94% Cotton and 6% Spandex for great 4 way stretch and comfort. Feels great, Cara Jodhpurs has all the expectations of a jodhpur with the addition of colour coordinated knee patches. Full zip fly, belt loops, reinforced stitching and elastic boot strap at the ankles (removable) with rolled up bottoms. Machine washable at 40°C. Leg length: Regular. There are currently no questions for HyPERFORMANCE Cara Jodhpurs - be the first to ask one!